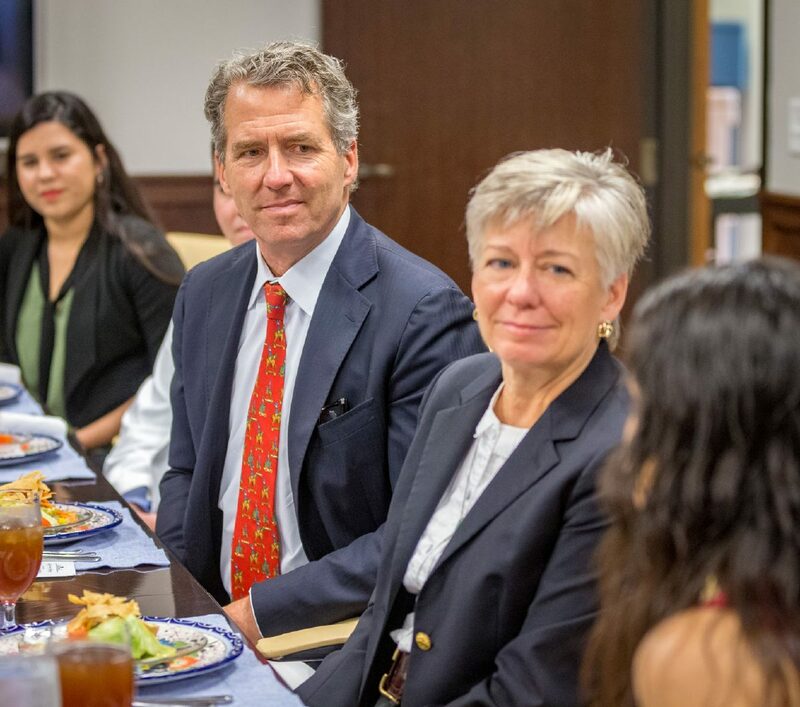 McALLEN — The longest visit to a University of Texas campus so far by Chancellor James Milliken and wife Nana Smith culminated last Thursday after two full days at UT Rio Grande Valley. And aside from student and faculty introductions, area legislators also got a chance to meet new UT leader. The visit was part of Milliken’s tour of all 14 UT institutions, which he hopes to finalize by the end of November. Part of the familiarization process involved meeting students, faculty and administrators at UTRGV, as well as Valley legislators and city leaders; anybody with a grasp of what the regional opportunities and needs are. City of McAllen Judge and UT Regent Ernest Aliseda said these campus visits are incredibly important due to all 14 institutions being very different. UTRGV’s is not only the newest university in the system but it also covers three counties — Hidalgo, Cameron and Starr — all along the Texas-Mexico border and all catering to a culturally different population than that of the state capital or other regions. Legislators from all throughout the Valley work together to advocate for the region’s needs and higher education remains one of the top priorities. During an interview Wednesday, Milliken echoed this sentiment and said a big part of his job is maintaining those relationships and creating them where there are none. In the case of UTRGV, which has only been up and running for three years after the dissolution of UT Pan American and UT Brownsville, the way to demonstrate its impact relies heavily in making its potential clear to stakeholders, Milliken said. The main reason why the UTRGV was created was to have access to state funding and to create a School of Medicine. This creates access to healthcare, medical careers and research, which Milliken acknowledged as a great part of this potential. Hinojosa said that during their meeting they went over some of the challenges faced by higher education in the Valley and statewide, including decreased funding. The chancellor was very receptive, he said, to the resources that could be leveraged to gain resources. State Sen. Eddie Lucio Jr., D-Brownsville, also had the opportunity to meet with the chancellor and said they discussed a wide array of topics, from the beginning of the Valley becoming a part of the UT System family in the late 1080s, early 1990s, to the evolution of the UT System institutions leading to UTRGV. Lucio said this compliments the drive of the current delegation, which Lucio described as the strongest one he has worked with since 1987. He said the entire Valley delegation has worked together to represent the Rio Grande Valley as a family and bring in the resources necessary to operate the still infant university. Both Hinojosa and Lucio said the plan is to stay in close contact with the chancellor in hopes to represent the needs of the regional institution at their best. Previous chancellors including Milliken’s most recent predecessors, William McRaven and Francisco Cigarroa, were close to the Valley before and after the transition to UTRGV. And the two senators said they got the sense that this relationship will be a positive one as well. This article was modified to reflect that UT Regent Ernie Aliseda is also a City of McAllen Judge.